LONDON (Reuters) – Indian conglomerate JSW Steel and global trading firm Duferco are in advanced talks on a five-year cash-for-steel prepayment deal, four sources familiar with the matter said, in a rare move for the industry. JSW, India’s biggest steelmaker, and Duferco had a prepayment deal in 2006 for $150 million in upfront cash that would be repaid over seven years with steel cargoes, but the scale of the proposed new deal is much larger. Two sources said the deal, expected to be signed this quarter, would be worth about $600 million. Switzerland-based Duferco, backed by banks, would provide the cash to be repaid with physical steel. Duferco, one of the world’s largest steel trading firms, declined to comment. JSW did not confirm the value of the deal, but said it has a longstanding relationship with Duferco that involves financing arrangements. One of the sources said JSW was looking for alternate sources of funding while, for Duferco, the deal would lock in future sales of steel with its clients. 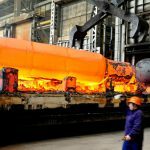 Jeff Kabel, chairman of the International Steel Trade Association (ISTA), said the deal would represent “a great move forward” for an industry that has seen few such arrangements to date. Steel derivatives, which allow buyers and sellers to lock in future prices, are still in their infancy, making trade houses wary of pre-paying for large tonnages and risk prices moving against them in the future. Such deals are frequent in commodities such as oil, with liquid derivatives markets that allow for hedging future sales. Rio Tinto To Post Better Financial Performance In 2018 Following The Sale Of Its Coal Business? © London Commodity Brokers Ltd.